ICE Spokesman Quits, Citing Leaders' Use Of 'Misleading Facts' To Discuss California Arrests : The Two-Way "I told them that the information was wrong, they asked me to deflect, and I didn't agree with that," said James Schwab, who resigned from his job at the Department of Homeland Security. A spokesman for Immigration and Customs Enforcement in San Francisco has resigned, citing disagreements over how to cast the actions of Oakland Mayor Libby Schaaf, who warned against immigration raids last month. 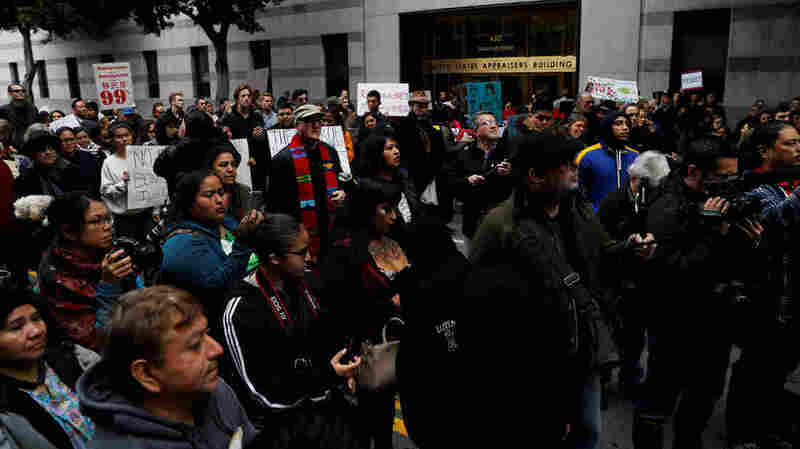 The raids prompted a rally outside the ICE office in San Francisco. "I quit because I didn't want to perpetuate misleading facts," Schwab told the San Francisco Chronicle. "I asked them to change the information. I told them that the information was wrong, they asked me to deflect, and I didn't agree with that. Then I took some time and I quit." In that four-day sweep through Northern California, Immigration and Customs Enforcement deportation officers arrested 232 people — but high-level federal officials, including President Trump, said Schaaf was to blame for 864 more people not being arrested. They pointed to her public warning of a pending raid, which she issued on Feb. 24, just as the operation was about to begin. ICE agents had targeted more than 1,000 people in the sweep. After the raid, a Homeland Security official said it's common for a large-scale immigration sweep to net about a third of its targets, as member station KQED reports. Trump called what Schaaf did "a disgrace," saying her warning was the sole reason that hundreds of people escaped arrest. His remarks amplified attacks by Attorney General Jeff Sessions and acting ICE Director Thomas D. Homan. Their claims were questioned by critics — and now by Schwab, a veteran public affairs officer who had worked at the Defense Department and NASA. 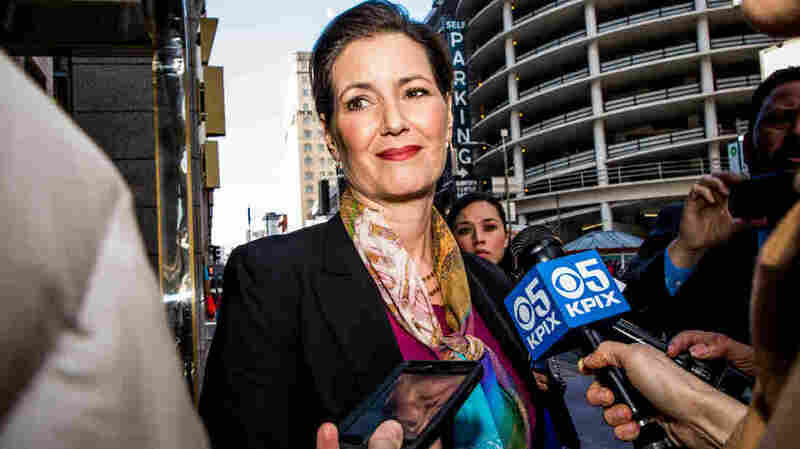 "I'm proud to live in a country where everyone can criticize elected officials," said Oakland Mayor Libby Schaaf, after President Trump said her actions were "a disgrace." "I didn't feel like fabricating the truth to defend ourselves against [the mayor's] actions was the way to go about it," Schwab told the Chronicle. "We were never going to pick up that many people. To say that 100 percent are dangerous criminals on the street, or that those people weren't picked up because of the misguided actions of the mayor, is just wrong." In his attack on Schaaf, Trump said 85 percent of the targeted immigrants had criminal records. But when KQED asked ICE to explain why the targeted people had been classified as threats to public safety, a spokeswoman cited only five, of the 864, who had been convicted of serious crimes. "Of the 232 people arrested, ICE stated that 115, or just under half, had 'prior felony convictions for serious and violent offenses' or past convictions for 'significant or multiple misdemeanors.' The other half had no criminal history. "When asked to specify how many arrestees were felons, spokeswoman Danielle Bennett would only respond, 'all of those arrested were arrested for being in violation of immigration law.' "
In addition to sparking criticism from the Trump administration, the case also prompted the government to look into whether Schaaf may have broken any laws by sounding the alarm about the pending raid — another front in the clash between federal officials and the leaders of sanctuary cities. Schwab has now quit his job as a Homeland Security spokesman in San Francisco — but that shouldn't be taken to mean that he agrees with what Schaaf did. "Personally I think her actions were misguided and not responsible," Schwab told CNN. "I think she could have had other options. But to blame her for 800 dangerous people out there is just false. It's a false statement because we never pick up 100 percent of our targets. And to say they're a type of dangerous criminal is also misleading." Of the battle over how to properly characterize the events, Schwab said, "I've never been in this situation in 16, almost 17 years in government where someone asked me to deflect when we absolutely knew something was awry — when the data was not correct." "However, 864 criminal aliens and public safety threats remain at large in the community, and I have to believe that some of them were able to elude us thanks to the mayor's irresponsible decision. Unlike the politicians who attempt to undermine ICE's critical mission, our officers will continue to fulfill their sworn duty to protect public safety." "According to Acting Director Homan, ICE failed to make 800 arrests that they would have made if the mayor had not acted as she did. "Those are 800 wanted aliens that are now at large in that community —most are wanted criminals that ICE will now have to pursue with more difficulty in more dangerous situations, all because of one mayor's irresponsible action." Trump said in a Cabinet meeting, "What the mayor of Oakland did the other day was a disgrace. Where they had close to 1,000 people, ready to be gotten, ready to be taken off the streets. ... The mayor of Oakland went out, and she went out and warned them all: scatter." Also last week, Sessions announced a lawsuit against California for impeding federal immigration enforcement and said, "You can be sure I'm going to use every power I have to stop that." Visiting Sacramento, Sessions said, "So here's my message for Mayor Schaaf: How dare you? How dare you needlessly endanger the lives of our law enforcement officers to promote a radical open borders agenda?" In response, Schaaf said, "How dare you vilify members of our community by trying to frighten the American public into thinking that all undocumented residents are dangerous criminals? ... How dare you distort the reality about declining violent crime rates in a diverse, sanctuary city like Oakland to advance a racist agenda?" California Gov. Jerry Brown criticized Sessions and called on him to apologize, saying his claims about Schaaf were "simply not true" and were politically motivated. Then came the remarks from Trump — and another response from Oakland's mayor. "I'm proud to live in a country where everyone can criticize elected officials," Schaaf said in response to a reporter's question about Trump. The war of words with Washington has put a new spotlight on Schaaf, 52, who took office in 2015 and is now running for a second term. "An insult from Donald Trump is a compliment to a California Democrat," political consultant Jim Ross tells The Mercury News in San Jose. The newspaper also spoke to California Republican strategist Matt Rexroad, who said: "I can't think of a single district that includes the City of Oakland, or any statewide office, where that would be a disadvantage. The only office she'd be costing herself votes in potentially is president of the United States."